I am wondering if we will see this supported as part of AMD commitment to support for AM4 platform? If AMD did increase core count that would give them the excuse to follow the Intel precedent and have an impact on previous motherboards and the customer in a bad way. As a customer that was waiting for Ryzen 3xxx as an upgrade path, I would feel very disappointed if that happened. It would be very similar to how Intel screwed Z270 owners and a very bad PR move from AMD toward its fans. The very minimum that should be supported in my opinion is on the midrange version of the previous chipset and the same core count that was supported on it. Basically a selective CPU backward compatibility support, 8 core on B450 and X470. After all, the only deficiency of an older motherboard can be power delivery but since power goes down on 7nm, this would make it so the same number of cores should be easily supported with a BIOS upgrade. All Socket AM4 CPUs will work on all Socket AM4 motherboards. 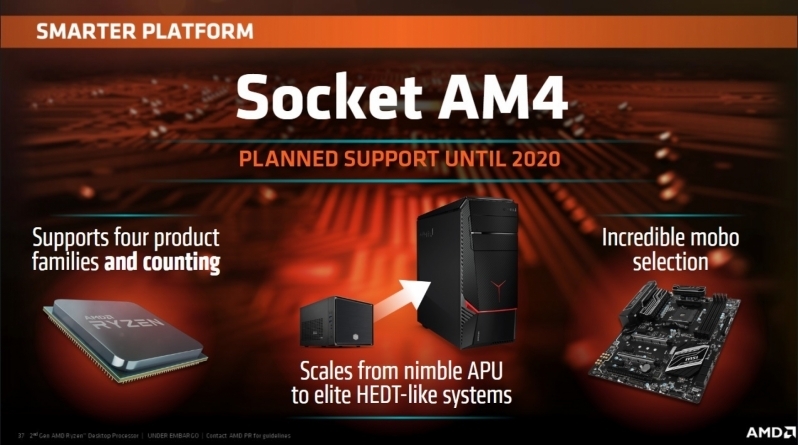 AMD has committed to Socket AM4 through 2020, which means Zen 2 next year, and Zen 3 in 2020. That is something you assume, since "All Socket AM4 CPUs will work on all Socket AM4 motherboards" does not equate to "Support for AM4 socket till 2020". You might see support for AM4 as BIOS and driver updates instead of new CPUs. Or you could see partial CPU support. How about AMD's statement on their website in all caps? Or their second press slide? I like your enthusiasm, but you are again reading stuff that AMD has not stated. They are legally covered to not release all processors on all AM4 chipsets. And I'm pretty sure they won't. One example is A350 will not get the Ryzen 9 with 16 cores, since those mobos do not have the power delivery (130+W) for it. amdmatt can take it from here. I don't think Matt will be able to respond as that would be "discussing unreleased products". However, from the power efficiency standpoint from AMD slides on 7nm even 12 cores would be possible on B450 and X470 boards. I guess we will know more at CES, next month.